Rev Kel Hodge is the Uniting Church's Rural Chaplain in New South Wales and the ACT. His brief is far from simple. He has a massive geographical area to cover and increasingly difficult situations in which to minister. Kel's appointment was initially a component of the Uniting Church's natural disasters response strategy. 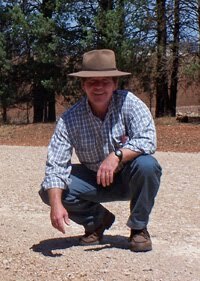 As well as providing encouragement and pastoral care to people facing tough times, he advocates for individuals and groups in rural areas and liaises with government bodies, the Synod Disaster Response Committee, and the Rural Support Service, a sub-committee of the Central West Presbytery which was established to support rural projects across NSW. He knows what is happening to people and families as they try to pick up their lives, begin again, and cope with situations that have started to get beyond their control. Kel says that connecting with others working in community welfare and development has been one of the most worthwhile, and necessary, parts of his job. 'A knowledge of who is out there, what they do and how they operate within their particular fields is essential for the position of Rural Chaplain. While the established church networks are important and useful, much of my role is concerned with the wider community in areas that churches do not reach'. The importance of sustaining a reasonable quality of life in rural NSW in the face of disasters is a position that some groups are questioning. Kel says, 'An economic rationalist would have us believe that individuals and communties that are not economically sustainable under the pressure of natural disasters have no right to be propped up by the rest of the economic system'. 'I do not believe that it would be wise or just to only consider the problems associated with living and working in the country through the eyes of an economic rationalist. In fact, as Christians, we are called to look at another's misfortune through the eyes of Jesus who helped those who were suffering'. As a rural chaplain, much of Kel's time has been given to listening to people talk about their concerns, whether they are financial, emotional, relational or spiritual. Kel says, 'I have been impressed with the response by our church to the call of Jesus Christ to be compassionate to those suffering. Many people within our church have made great efforts to express their faith in service to the people of rural NSW. We hear a lot of talk about how our church communities are dysfunctional. I wish to share with you the good news about the Spirit of God working through the compassion of others in our small part of the world'.